We get asked our opinion about Organic Royal Jelly here at Bee Pollen Buzz quite a bit. So I'd like to take this opportunity to address the issues and realities of producing and selling organic royal jelly. Before writing this article I might add, I sat down with my beekeeper father (John) and interviewed him about this topic to make sure I got my facts straight. As a successful beekeeper, he has over 2000 hives, mostly in Ontario, but also in other parts of Canada. With over 28 years experience as a beekeeper and a former Vice President of the Canadian Honey Council, I'd say he has his 'ear to the ground' so to speak when it comes to the realities of the royal jelly market place. In Canada, according to become legally “certified organic”, the bees must be kept in a controlled 3km radius from any type of spraying. Since a large part of beekeeping is pollination, most commercial beekeepers (those who own more than 20 hives), are transporting their bees to farms all over the country or region they are responsible for. The farmers “need” the bees to pollinate their crops so we can enjoy the summer and fall harvest. In other words, the bees are being moved around from farm to farm, and there is literally no way of controlling the sprays that the farmer or the farmer next door is using. The only thing that this beekeeper does is to manage the hives the best they can and put the hives far enough away from any direct spraying. The amount of residue from the wind, air and what is left on the plants is limited in making its way into the honey because of the natural protective action of the bee propolis inside the hive. Bee propolis is a sticky resin that seeps from the buds of some trees and bark. Bees use it to narrow the opening of their hives to keep out unwelcome intruders. It literally acts like a filter that cleans the bees as they enter the hive. There are experts that would argue that this protective action limits or prevents pesticides from entering the hive and making their way into the royal jelly. 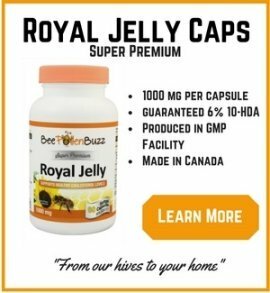 So this begs the question - is there a big difference between certified organic royal jelly and non-certified? Is it worth the premium paid for certified organic? To be honest, I'm not sure I know. The problems that beekeepers currently face in producing a truly organic product seem so big to me that I wonder if its even possible? The only scenario I see capable of producing a truly organic royal jelly would be to isolate your hives on a non-inhabited island somewhere in the middle of the ocean and hope that wind currents don't drift any contaminants over your hives. And that just doesn't exist anywhere in the world anymore. Don't get me wrong - I am a huge proponent of organic farming and the organic movement. I eat everything I possibly can eat organically. While it is a bit expensive still, I feel like the benefits far out weight the financial cost. 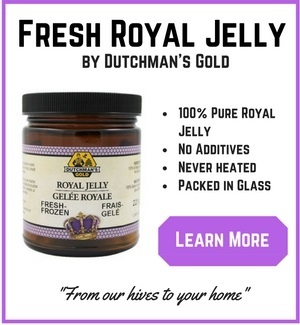 Ultimately, my point is this - truly organic royal jelly just might not exist so focus on obtaining a royal jelly that was sustainably produced in an area as far away from industry as possible. 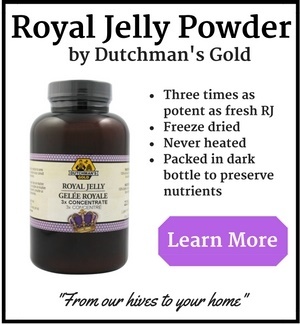 And let me warn you - so called 'organic royal jelly' is sold all over the internet. Before you lay down your hard earned money for this stuff, ask the producer some of the questions I've proposed here and see what kind of answers you get!